Our BBC Four series on the history of murder is being re-shown on BBC Four at the moment (episode one is on Iplayer now, episode 2 will be shown next Saturday at 8pm) so I thought I would re-post this article from BBC History Magazine. You can also hear me talking about it on the History Extra podcast here. ‘As Britain’s cities expanded in the early 19th century, so too did the nation’s obsession with murder. 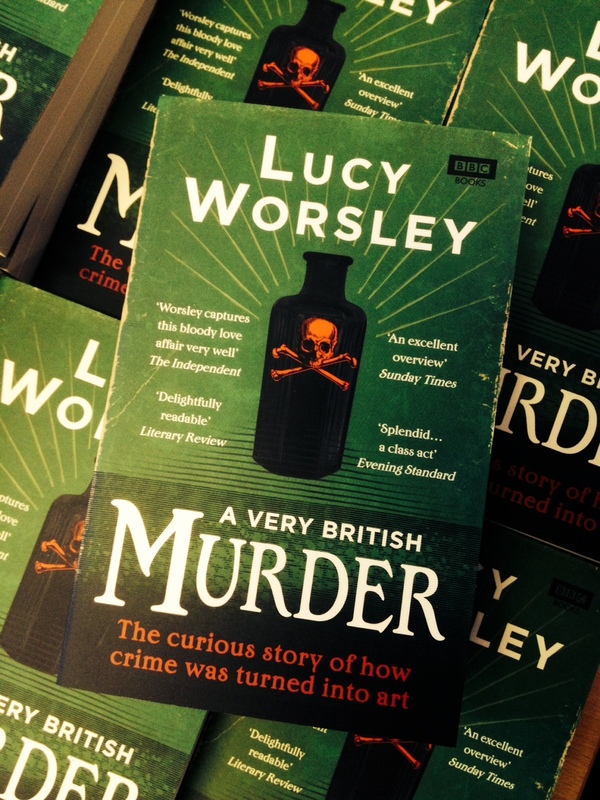 Lucy Worsley selects a series of objects that testify to Britons’ fascination with this most grisly of crimes – from the Regency to the Second World War. The editor’s instructions were clear. ‘More blood!’ he demanded, ‘much more blood’! Edward Lloyd was, after all, in the business of publishing ‘Penny Bloods’, the cheap and lurid form of fiction that nevertheless taught working class people how to enjoy literature. He and his authors were making money out of a new obsession with murder and crime that entered the entertainment industry in the early nineteenth century. It remains alive and well to this very day, when detective stories and dead bodies still dominate the TV schedules. Why did the British become – in the words of the late Georgian writer Thomas De Quincey – a nation of ‘murder-fanciers’? It was a development linked to urbanization, industrialization and everything that we might call ‘civilization’. In the crowded cities of Regency Britain, people no longer knew their neighbours. Until this point war, famine or disease had been their greatest fears, but now, community ties weakened, strangers represented danger. In 1811, one particularly horrific crime provided a turning point. The slaughter of a family of four in the East End became known as The Ratcliffe Highway Murder. In the whole of the previous year, there had been only 15 convictions for murder in the whole of Britain. A new terror had entered modern life. It was The Ratcliffe Highway Murder which inspired an essay, published in 1827 by the zany, opium-addicted Thomas De Quincey, called ‘On Murder Considered as One of the Fine Arts’. He identified a new phenomenon: the consumption, or the enjoyment, of murder. 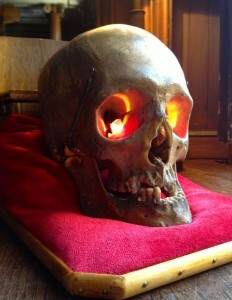 Hearing about or reading about a murder satisfied a ghoulish, slightly guilty relish that people now had for tales of slaughter and suffering. 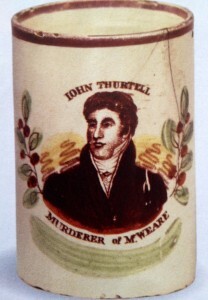 This ceramic mug commemorates murderer John Thurtell, who killed a friend for his money in 1823. They both lived in a murky underworld known as ‘The Fancy’, which was made up of professional boxers and the promoters and gamblers who made money from them. Thurtell’s victim was a fellow dodgy dealer, William Weare. Thurtell and his somewhat inept accomplices threw Weare’s corpse into a pond. On discovering that the water was too shallow to hide it, they pulled it out and tried another one. 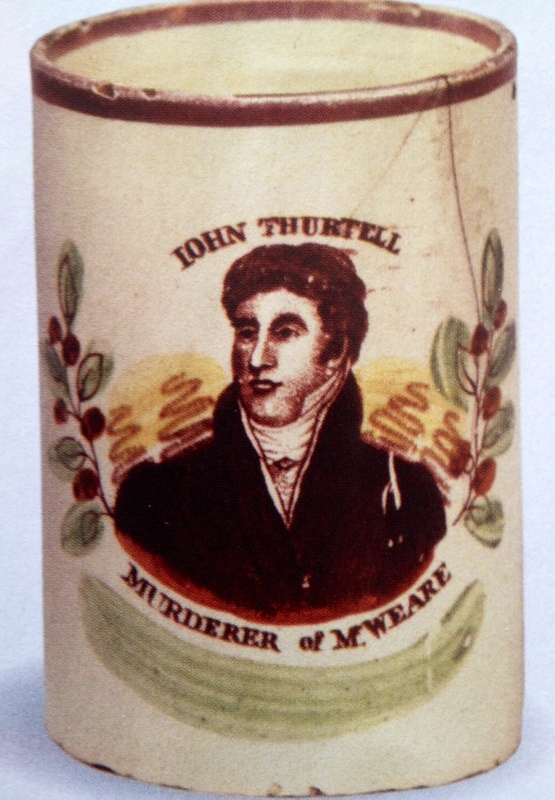 Thurtell was easily caught, and there’s something rather eighteenth-century about his career as a murderer. The public liked him because of his good humour and charisma. They also had a more positive image of violent crime than we might expect. In Georgian times capital punishment was attached to all sorts of crimes against property as well as to murder, so that a captured criminal was considered unlucky, rather than evil. Hence the Georgian public’s fondness for dashing highwaymen, or a ‘gentlemanlike’ murderer like Thurtell. Many of the crowd of 40,000 who gathered to watch him hang found him a heroic rather than an evil character. The ‘Red Barn’ in the sleepy village of Polstead, Suffolk, was the scene of a crime that became one of the most potent stories of the nineteenth century. In 1828, the dastardly William Corder tricked his lover, Maria, into believing that he would elope with her. Instead, he killed her, and buried her beneath the Red Barn floor. 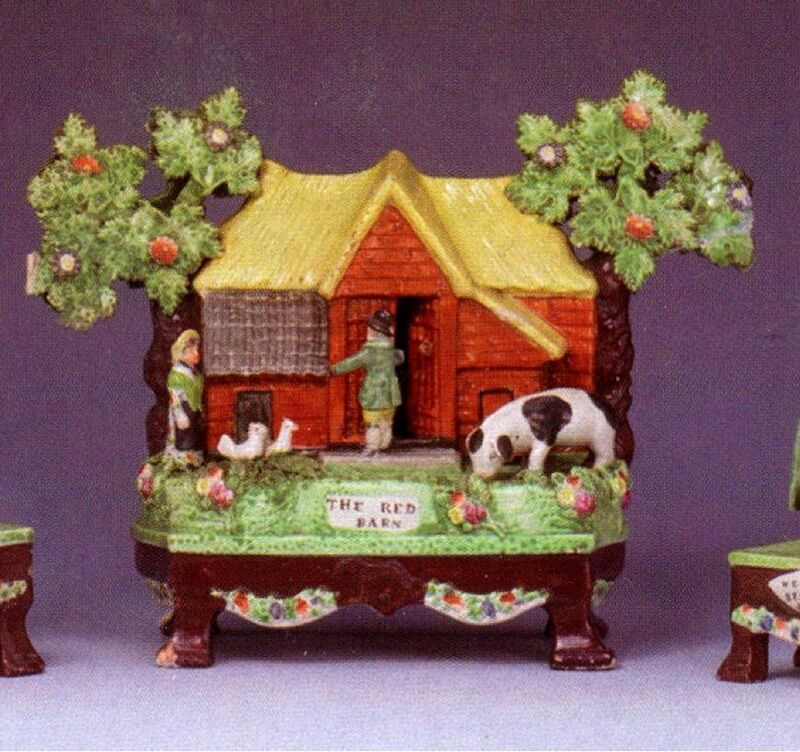 The crime scene became a popular ceramic ornament, and here William beckons his victim into the barn. Meaningless unless you know the story, this item, placed on your mantelpiece, would certainly provide a talking point for your guests. 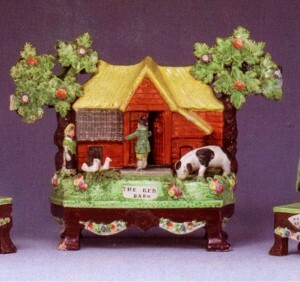 The real-life events of the ‘Red Barn’ were very quickly transformed into ballads and broadsides, and into melodrama performed in the London theatres. And even country people could enjoy the story in the form of a travelling puppet show. Performed with the utmost seriousness, these puppet performances were shocking and tragic. 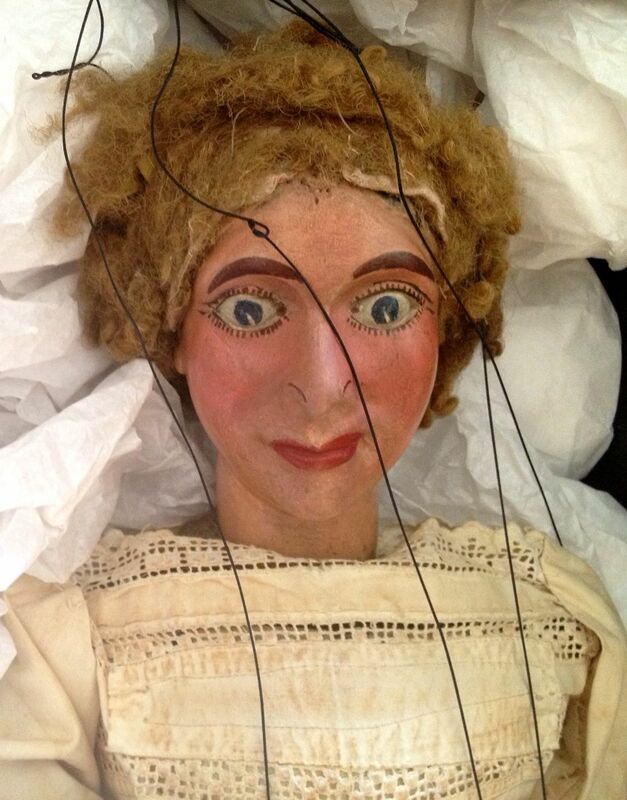 These marionettes of Maria and her murderer belonged to a company that toured East Anglia. They demonstrate how the protagonists conform to the stock characters of melodrama with its black-and-white tales of passion and revenge. Maria has been turned into a rosy-cheeked virginal maid in white, while William Corder (not pictured) has a villainous moustache. In the 1840s and 50s, the British began to suffer from a new fear of being poisoned. The growing industry of life insurance meant that now the relatives of middle class people had a pecuniary motive for bumping them off. 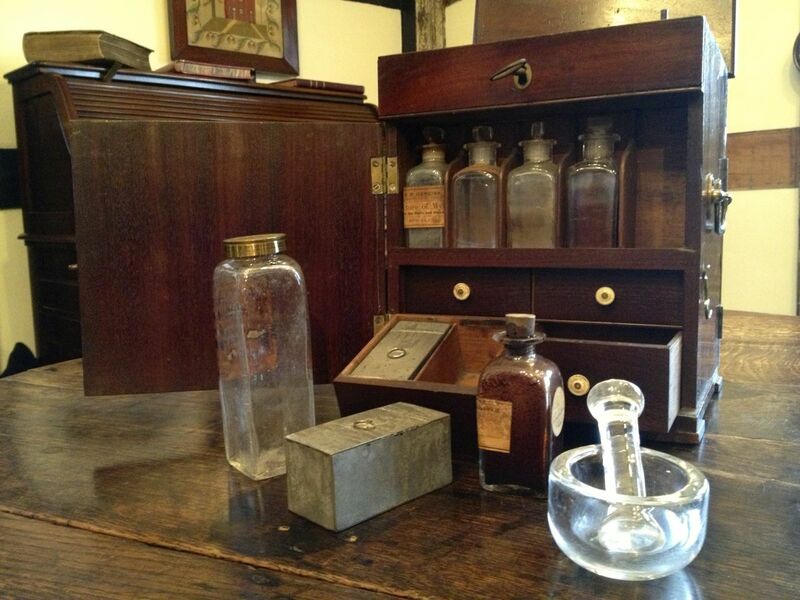 Dr William Palmer of Staffordshire (hanged 1856), whose medicine chest this is said to be, was the classic murderer for this newly-paranoid age. A respectable doctor who had got into debt, he took out various life insurance policies, and poisoned various friends and relatives for their money. He was particularly frightening to the middle classes, because it now seemed that a murderer might penetrate even a respectable drawing room. Working class people in the early nineteenth century had a strong taste for blood in their broadsides and ballads. It was writers like Charles Dickens (Bleak House, The Mystery of Edwin Drood) who made stories of crime and detection respectable for middle class readers too. A great new wellspring of fiction was created, in 1842, with the founding of the ‘Detective Branch’ of the Metropolitan Police Force. But the private detective business remained in good health alongside it. In the 1860s, a novelty came along, a rash of novels about female private eyes like this one by W.S. 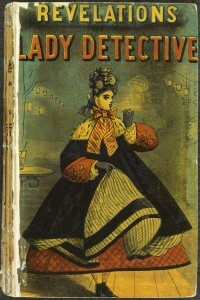 Hayward, The Revelations of A Lady Detective. The cover art suggests that the heroine is rather ‘fast’, revealing an ankle, and unafraid to smoke in public. 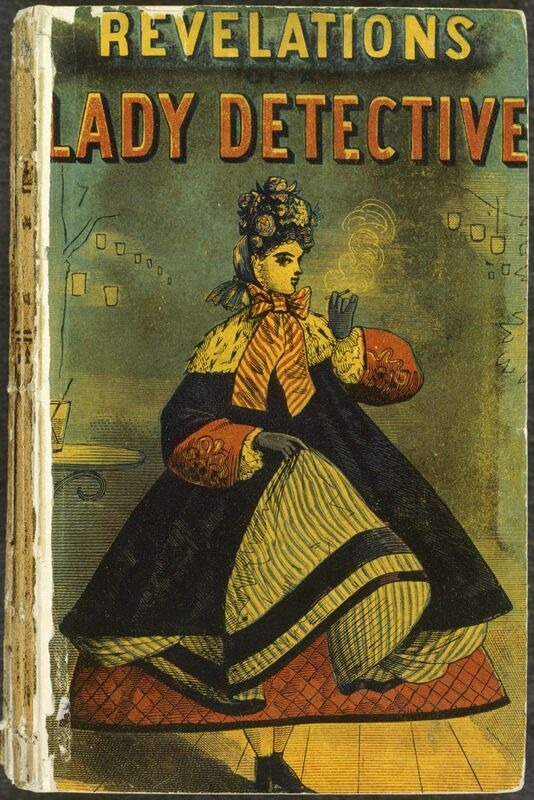 But the ‘Lady Detective’ seems admirably free-spirited. At one point, while chasing a villain, she finds it necessary to drop down through a hatch into a cellar. Her fashionable crinoline won’t fit through the hole, so she simply takes it off and abandons it. It’s a wonderful moment of female emancipation: freed from the ‘obnoxious garment’, as she calls it, she is able to get on with her work. 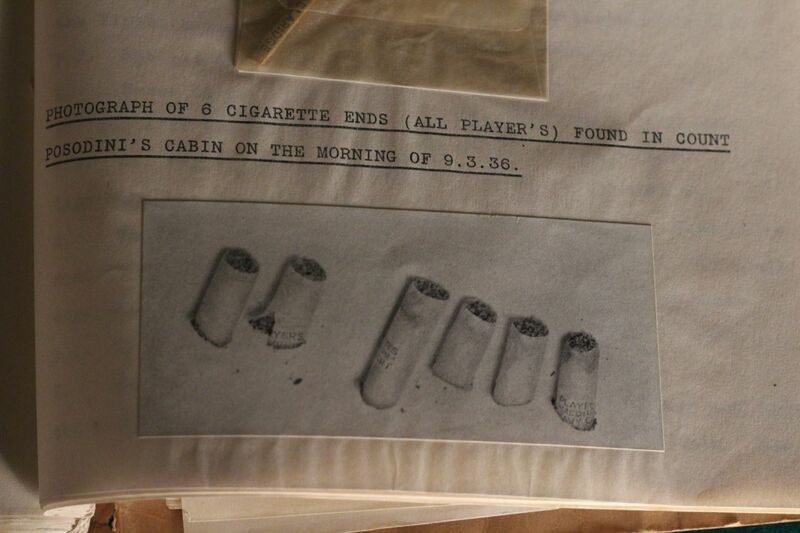 The First World War transformed crime fiction. Edwardian readers had loved an active, gallant, patriotic detective. Sherlock Holmes, for example, uncovers a German spy in one late story, and has no hesitation in using a gun. After four traumatic years, though, tales of violent derring-do seemed out of place in a nation where it seemed that nearly every home had lost a son. Now crime writers erased the violence, and turned detection into a genteel business that was rather like doing a crossword puzzle. 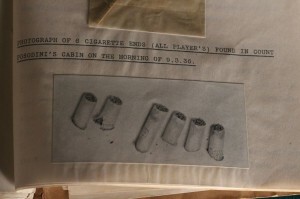 Here we see the inter-War conception of murder as a game: ‘Murder Dossiers’, like this one, came complete with clues such as a blood-stained piece of wallpaper, crime scene photos or a matchstick, with the solution provided in a sealed envelope at the back. In 1934, about one eighth of all the books published were detective novels. This was big business, and the most successful of the authors behind this crime wave were women. They excelled at the social observation, the intricate plotting, and the large numbers of female characters readers now required. Dorothy L. Sayers was the best of them, combining humour, and insight into the female condition, with crime-solving. She was among the founders of ‘The Detection Club’, a mutual admiration society for detective novelists. The Club developed its own arcane initiation ritual that involved swearing an oath upon ‘Eric the Skull’, his eyes illuminated with red bulbs. Aspirant members had to promise in their novels ‘to observe a seemly moderation in the use of Gangs, Conspiracies, Death-Rays, Ghosts, Hypnotism, Trap-Doors, Chinamen, Super-Criminals and Lunatics, and utterly and forever to forswear Mysterious Poisons unknown to Science’. I’m a great fan of all your documentaries, but particularly “A Very British Murder” being a crime writer myself. So far, I’ve watched it every time it’s been repeated. Any chance of any more?